gives you the freedom to draw, without erasing any marks. takes away the preciousness of each mark. learn to deal with the unexpected. focus on the gesture of the mark rather than a subject. The stick is your mark making tool, use it like a nib pen. Dip the stick into the ink and draw. 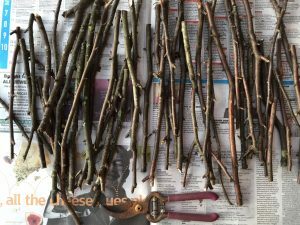 Explore the different marks you can make with your stick. If something unexpected happens can you do something with it? Don’t worry about subject matter at this stage, just focus on the marks and the quality and variety drawn. Now try adding water. Using a brush add water whilst the ink is still wet. You will need to experiment with the quantity of water used. Take any excess water off the brush with a piece of absorbent tissue. Add water to the paper first then draw into it, experiment again with amount of water and ink used. Draw a line and while the ink is still wet touch one side of the line with a wet brush. This produces lovely soft tones. 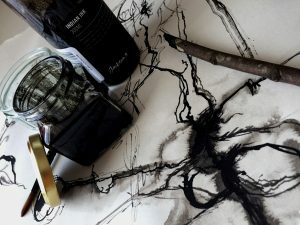 Continue to explore the different ways in which you can draw with the stick and ink, try holding it in different ways. How do you make a thick or a thin line, can you vary the tone? As well as line, try splattering ink, either on dry or wet paper. You could try splattering water first, then ink. The possibilities are almost endless. Don’t worry about making mistakes, unexpected things will happen! Don’t worry if it looks a mess in places, because it will! Learning how to handle drawing tools and how materials react when used in a particular way, enables us to make decisions and take control of the drawing process. Above all it increases confidence and the desire the explore further. Allow yourself time to play, if you spend an hour filling a page or two with a variety of drawn marks its time well spent and remember have fun! 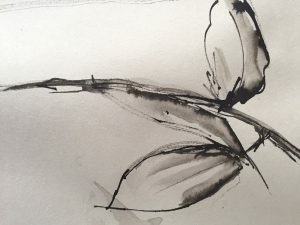 Now why not try choosing a subject to draw with your stick and ink. For further mark making and drawing excercises see here.